Every production at the Folger is an exercise in innovation. The experimental magic alone is a reason to attend plays there, and frequently. The Folger’s latest, beautiful experiment, “Antony and Cleopatra,” will play at the Folger Theatre through November 19. Fearing the death of his beloved Cleopatra, Mark Antony (Cody Nickell) solicits Eros (Anthony Michael Martinez) to end his life. Photo by Teresa Wood, courtesy of the Folger Shakespeare Theater. Except that Mark Antony, as played by Cody Nickell, is portrayed as a kept man despite his bad-boy bravado and penchant for hedonism. Life is good with Cleopatra: Why return to where things are cold and duty-bound? His conscience is stirred in Shakespearean fashion by a death: His wife, Fulvia, has died. The other ghost forcing Antony to leave his nest of love is Pompey, whose threats to the Roman Empire need to be addressed urgently. Throughout the play, it is the ancillary characters who shine best. They are the ones who convey the emotional and physical load of having to deal with these conceited, larger-than-life personalities up close. And it is through their reactions that we are hit by the gravity of a leader besotted with a woman who is most in love with herself –and vice versa. The feeling of powerlessness, of doom in knowing that this is not going to end well, is distilled in the well-staged battle at sea. When Mark Antony turns his ships to follow Cleopatra’s and we are nearly blinded in flashes of fire –with another nod to Andrew Griffin– we know we are caught in a story as large and as convoluted as a Taylor-Burton romance, or even a Kylie-Tyga romance (for the millennials). As the play progresses, our V.I.P. status wears thin. 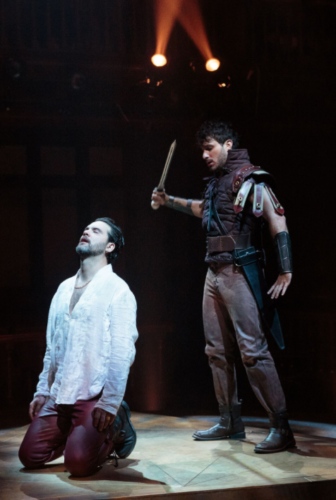 Antony and Cleopatra’s tantrums and insecurities are set under such a magnifying glass and pushed up so close in our intimate theater experience, that I found myself almost rooting for the sword and the asp. Antony’s death, in particular, reveals him as a cowardly man– one whose mind is too filled up with emotion to think things through to their last consequence. When his faithful servant, Eros (Anthony Michael Martinez, excellent again), accidentally stabs himself in his fear to hurt his master, Antony is ravaged by a rapid cycling of grief, guilt and self-loathing. It is a horrible way to realize you are human, and that your actions hurt others. WHEN: This weekend, through November 19. Click here for tickets.